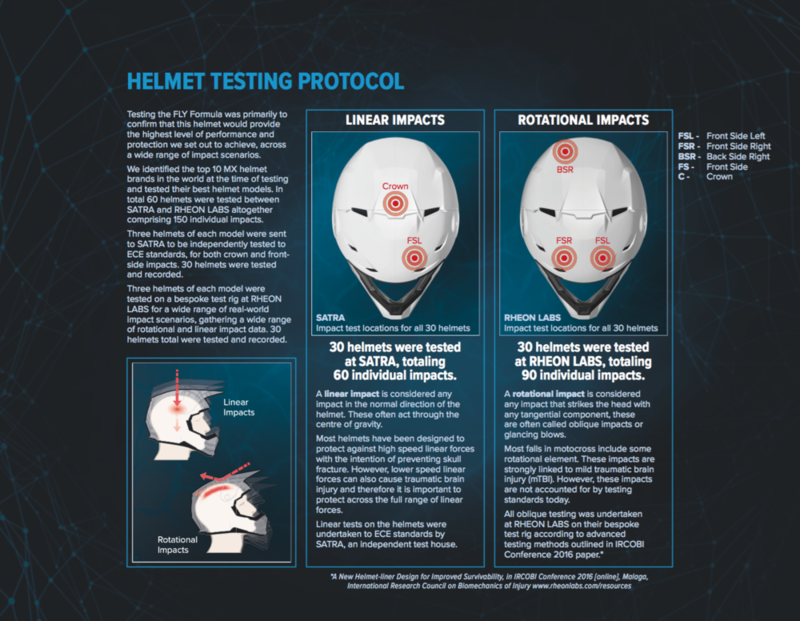 Boise, ID – FLY Racing is proud to announce the release of the Formula Helmet test data conducted by two separate test facilities: RHEON LABS, a materials technology business servicing the sports equipment industry, who has developed high energy absorbing materials with advanced testing methods for helmets to replicate real world scenarios and SATRA Technology, a third-party leading independent research and testing organization based out of the United Kingdom certified in ECE testing. RHEON LABS is a materials technology business servicing the sports equipment industry, who has developed a revolutionary highly strain-rate sensitive material – RHEON™ – capable of absorbing high levels of energy in impact, tension and vibration. The technology is patent protected and emerged from 15 years of research work carried out by Dr Daniel Plant at Imperial College, London. Scientists, engineers and designers work with best-in-class sports brands to build custom integrated solutions to enhance the performance, comfort and protection of their products.